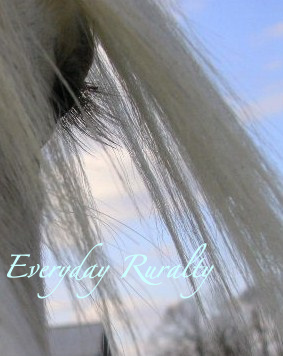 Everyday Ruralty: Beauty is in the eye of the beholder. Rocky's beautiful, soft brown eyes and his long lashes make him so handsome! What an awesome capture!!! Love it! Eyelashes are gorgeous. What a fantastic angle to take the photo from. Thoroughbreds account for more of the population than humans where I live. What a superb photo! Would you mind if I used it as my desktop picture please? wow,that is a close-up of eyelashes.. Cool~! Great picture ~ you did good~! Oh, your photo and Rocky's eye has captured my heart!! Great post, glad I stopped by! That is a really cool shot - Love it! Great pic! It's crazy busy at this house. I needed a reminder to stop and smell the roses! That picture needs to be 'biggified' and put on the wall! It's beautiful! I went back to your Wednesday post. I've been part of a Linky group for weight loss as well. Do you mind if I share a link to your post and the questions you shared?